Before you can participate in a project or translate any content, you’ll need to have a free translator account on Transifex. There are a couple ways to get an account. 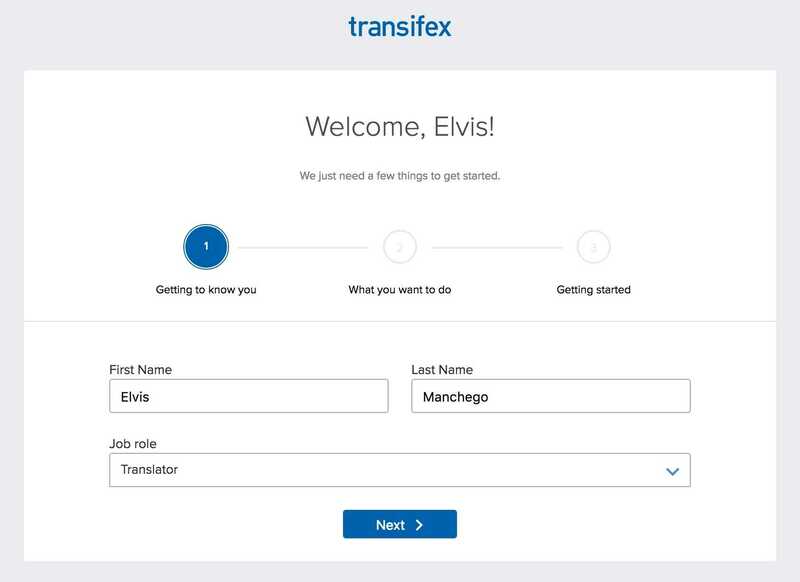 Go to www.transifex.com/signup/ and register for an account. If asked to activate your account, check your email for the activation link and click on it. On the first page of the Welcome page, fill in your name and select Translator as your job role. Hit Next to continue. 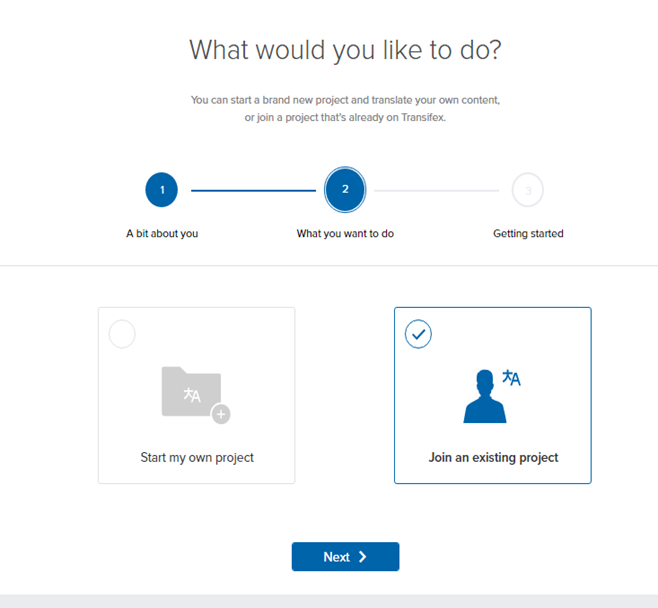 The “Join the existing project” option will be pre-selected for you. Hit Next again. Finally, choose which languages you can speak. When you’re ready, click Get Started. You’ll be taken to the Explore page, where you’ll be able to find and join a project. If you were invited to join a translation team on Transifex, you should’ve received an email with a link to set up your account. Click on the link, then complete the signup form and click Create my account. After creating your account, you’ll be automatically taken to page of the Team that you were invited to. Note: If someone sent you an invitation to join Transifex, you can skip ahead to the next section about finding and translating content. Each company in Transifex is represented by an organization. Each organization has projects containing all the content that needs to be translated. Each project is then translated by a team of people who are part of the organization. Teams are made of Translators, Reviewers, and Coordinators, grouped by the language they work on. From the Explore page, search or look for the project you want to join. Once you found the project you’d like to join, click on its name. Click the Join team button on the right side of the header. In the popup, select which language you want to help translate to. Depending on how the team is set up, you will either be immediately accepted to the team, or someone from the team will need to approve your request before you can join that team. After you’ve been approved as a translator, you’ll be notified by email. From then on, you’ll see the project in your dashboard and you can translate it. If you have any questions (about adding a new language to the project you're interested in, about why your join request hasn't been approved yet), you would need to contact the project administrators directly. You can find their contact information on their website or social media. 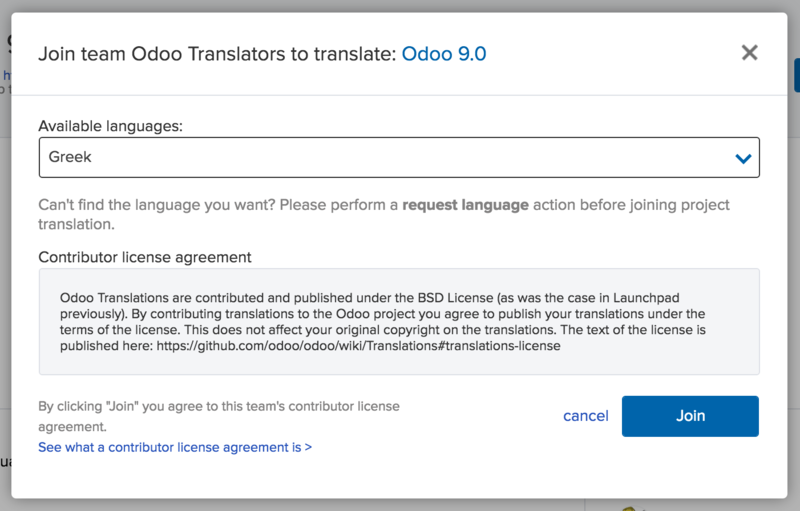 If the project you want to translate is private, an Organization Administrator or Team Manager will need to invite you as a Translator or Reviewer of a language of a team that's translating the project. Simply give your Transifex username to the person who will invite you. Once you’ve joined a team, you’ll be able to start translating. Below in the Continue Reading section are some articles to help you get started. We recommend reading through them in order.